CBD shatter gets its name from its brittle, glass-like appearance. It can also appear in the form of CBD crystals or just a broken up bit of CBD. It usually comes in a small tin or tub and often contains a high concentration of CBD. What is shatter, exactly? It is one of the purest forms of CBD, or cannabidiol, but with terpenes mixed in to add flavors, aromas, and intended effects. 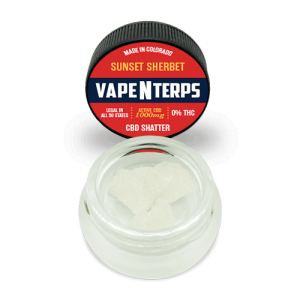 We offer a wide variety of CBD shatter options, with strains from Pineapple Express to OG Kush and more. These terpenes derive from natural plants and are designed to mimic popular medical marijuana strains that offer a wide range of benefits. However, it offers all of this without the high, since this pure CBD isolate derivative contains no THC. Get all the latest information on Events, Sales and Offers. Sign up today! 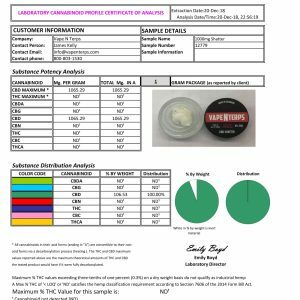 You must be 21 or over to access VapeNTerps online shop!